Turrall Fly Pod Hares Ears Selection, the original gold ribbed hare's ear nymph is a must have in any fly anglers box. It is not intended to imitate a specific insect but is a great all round representation of many. This selection provides all combinations of hare's ear - un-weighted, weighted, bead heads, tungsten bead heads and hot heads. 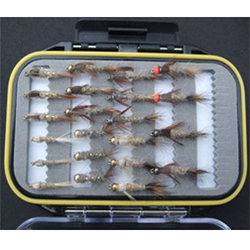 Turrall Fly Pod Hares Ears Selection contains 22 Flies in 8 different patterns. A good selection and again well presented.